2019 Beneteau Monte Carlo 5 - Flybridge or Sports Sedan configurations available. Beneteau's Monte Carlo 5 is the model of a new generation... A powerboat in an ocean all of its own. It boasts elegant, luxurious textures with exquisite attention to detail on all finishes. Acclaimed and accomplished Italian designers leave nothing behind in their quest for perfection. State of the art technology brings sound and entertainment, including wi-fi connectivity, right to your fingertips. With an outdoor space designed for entertaining, the immense shaded flybridge combines the helm station, sunbaking area, exterior galley and a large dining area. Critics have hailed the MC5 flybridge as "the most desirable and freethinking sub-50-foot flybridge money can buy. " If you prefer, you can choose the sedan option. The unique hardtop lounge area is the hallmark of this luxury motor boat. Converting into a huge sunbathing area for four, this space is unique and comes equipped with an audio system, fridge and a canvas shade awning. The MC5's undoubted beauty is all about 'reason, maturity and discipline' and the 'Wave Piercing' hull is one of the key components of that approach. This revolutionary hull achieves greater efficiency than a traditional hull. The tulip-shaped bow enables a flatter trim and better wave deflection for improved helm visibility. The elegance of this hull together with its twin Volvo IPS 600 engine delivers smooth, efficient, high-performance cruising. Soak up the Mediterranean lifestyle, anywhere in the world. 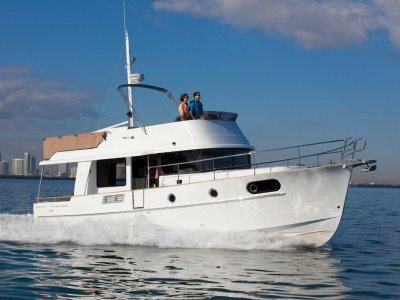 The Monte Carlo 5 has a unique, classic European appeal and speaks the language of affluence, entertainment and connectivity. An atmosphere of luxury surrounds every available space. Fully retracting glass doors seamlessly connect the indoor and outdoor spaces. Experience three high quality, detail focused private quarter cabins and two shower rooms. Choose between an open and contemporary light oak or dark warm matt walnut finishes. Bespoke luxury... With a little Italian flair. 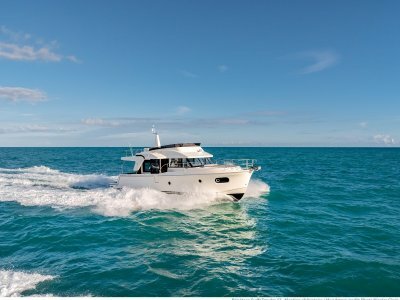 The Monte Carlo 5 boasts state of the art, best in class technology and connectivity. Entertaining never sounded so good. Experience intuitive technology that keeps you and your Monte Carlo 5 in sync at every moment. 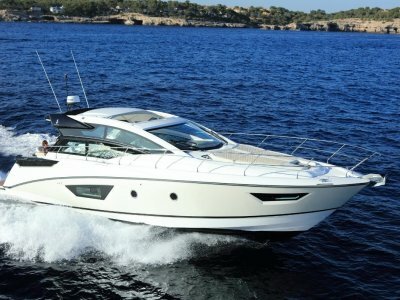 Key features include 32'' TVs in the saloon and master suite, Bose 2.1 hi-fi system, Fusion 700 Audio/DVD player, Dock iPod with Bluetooth connection, two remote controls (cockpit and flybridge) and exterior speakers. "Groupe Beneteau is setting out to capture the hearts and minds of boaters who want a yacht that looks modern, has high style with an Italian flare, has three staterooms, and looks like more than a million dollars, but costs significantly less. The company has also chosen to appeal to the minority of boaters who know a well-executed boat when they see one. " 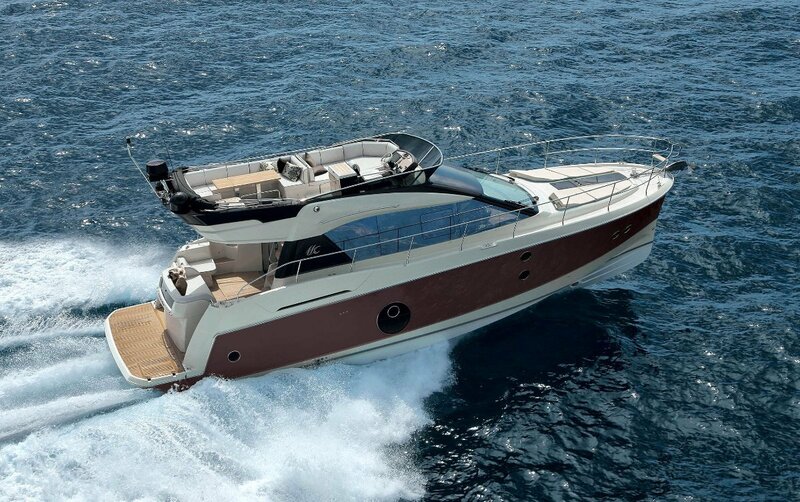 "Groupe Beneteau has produced what could be a new trend in mid-sized cruising powerboats. This three-stateroom, two-head cruiser with flying bridge is powered by twin Volvo Penta IPS500s and has details and amenities intended to appeal to veteran boaters looking to move both up and down. " The interior photos show 2 options of colour palette; Light Brushed Oak with Cocoa leather OR Matt Walnut with Bordeaux leather. 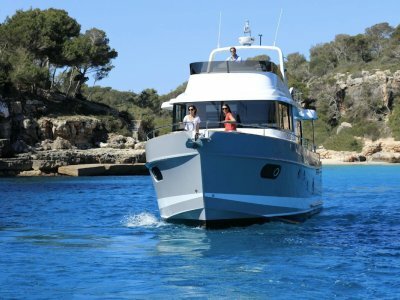 The external photos of the flybridge are taken with the full-length bimini folded down. Contact Flagstaff Marine for more information. 3 cabins & 2 bathrooms, plus optional 4th crew cabin. Full beam owner's cabin amidships with ensuite, VIP double cabin forward with ensuite, and 3rd cabin with full length bunks. Optional 4th cabin in lazarette for crew (or teenagers). 2 internal showers plus H&C deck shower. Galley is positioned aft on main deck, central to the entertaining zone onboard. Plenty of refrigeration in the galley plus fridge on the flybridge. Electric microwave / convection oven combo. BBQ at outdoor galleys on the swim platform & flybridge. Full safety pack included with all new boats purchased through Flagstaff Marine. Electric & manual bilge pumps. 12V, 24V, inverter & genset. State-of-the-art electronics & navigation equipment.